Huawei P30 Pro vs Samsung Galaxy S10 Plus: So, if you’re buying a smartphone in 2019 and you want the best possible one, you’re probably looking at the galaxy S10 Plus and the Huawei P30 Pro. The galaxy S10 plus has a fresh new design, they’ve thinned out the bezels and instead of using a notch like other smart phones, they’re using a camera cutout in the top right hand corner. The p30 Pro in the other hand has very similar bezel sizes, but the difference is instead of a cutout they’re using a notch on the top. Now, in terms of form factor they’re pretty much the exact same size the only difference is that the p30 Pro is slightly taller. The two biggest smartphone releases this year together in one frame and with so many similar things, but there is something that separates them together. Both devices share the same storage and RAM memory, with 128 gigs of expandable storage and 8 gigabytes of RAM. And to get one thing all the way, they’re both pretty similar feeling phones. The quad way is a little bulkier, but both do a really good job of curving in a way that makes them feel comfortable to grip. They even share the same a prismatic finish that reflects warmer colors; although, I do like how the p30 pro has the option for a gradient surface on the back. And in the other side, I see that the S10 Plus display looks so much more elegant, beautiful and vibrant. Samsung’s smaller camera bump is nice; though, it not only means the phone fits a little better in your pocket, but also makes it more balanced when it’s on a flat surface. You’ll notice that the Huawei has just that little bit of wobble, also Samsung has a headphone jack. It is nice to see that both devices are IP 68 rated against water and dust, and that they both support fast wireless charging, as well as the ability to wirelessly reverse charge other devices. Display: When it comes to displays, though, the Galaxy S 10 plus is just so far ahead. They’re both similarly sized OLED panels with an almost identical curvature on the sides, but whilst the p30 pro has a respectable full HD plus resolution, the S10 plus has roughly twice as many pixels on its screen. Notch: When it comes to the notches Huawei has stuck to what they know with this water-drop notch in the middle on the top screen, which isn’t bad at all as far as notches go. Samsung Galaxy S10 Plus has a hole punch that got the screen all the way around it, which makes the interruption a little easier to filter out when you’re watching video or playing Games. Security & Locking: It looks like both companies follow the same philosophy, even in the security aspect; because, they’ve made the same changes. Samsung have ditched the iris scanner they used to have on past phones. And Huawei has skipped the 3D facial recognition we saw on last year’s Mate 20 Pro, even though, it was really great. Anyways, that leaves us with fingerprint scanners as the only fast and reliable way to unlock any of these handsets. And whilst this is the best fingerprint scanner Huawei has ever put on a smartphone, Samsung takes it this time round by using an ultrasonic in-display scanner, which is faster and requires less force to unlock the phone. Audio Quality: the audio quality is really important, if you use your phone to watch movies and listen to music. And thankfully the p30 pro has a good speaker, but the way they’ve designed the earpiece to just kind of sit below the glass, means that its volume can’t keep parity with the main speaker, so you’re just getting a single speaker set up. And if you compare that to S10 Plus’s dual speaker Dolby Atmos system, it’s just not the same. While his new earpiece design should mean, no sound leakage and maintain privacy when you’re on a call. So, only you can hear what the other person is saying. How To Fix a Sticky Apple Watch Digital Crown Easy. iOS vs Android | Why do people prefer iOS over Android. Software: Anyways, in my full review of the S10 plus, I talked about how much I liked Samsung’s new one UI software skin. And nothing has changed with that, I still love how fluid and simple it is and it’s exciting. But Huawei’s p30 pro is getting a bit of a software refresh of its own, and the difference is a settlor. And whilst both phones are very fast, Samsung’s software is now more inviting and in my opinion cleaner looking. And they both run Android 9 at the box. Front Camera: while the S10 Plus has dual front-facing cameras, the P30 Pro only has one. But Huawei has the advantage on the resolution side, because, the P30 Pro has 32MP in its front-facing camera versus 10MP on the Samsung’s. One thing to mention here, is that neither of these handsets is going to disappoint you when it comes to taking selfies. When taking portrait selfies on the P30 Pro, you’re going to lose a little bit of realism. But at the same time you’ll probably get nice sharp results (that’s kind of personal preference, if you like to be more beautiful in the pictures than in reality, then this is you right cam). 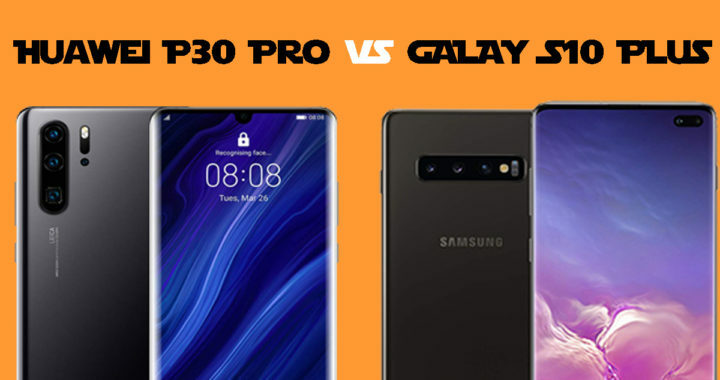 Rear cameras: of course both of these phones are already industry-leading, but there are some key differences that meant to mention here: starting with the P30 Pro that has special camera that the s10 plus doesn’t, which is the time-of-flight sensor. And what this basically do, is gives the phone a better understanding of depth in theory, which automatically results in better portrait mode shots from the rear camera, as well as the being able to better track objects in augmented reality. Both phones have a telephoto camera to get closer to subjects without any loss in quality. But there is one side in which P30 Pro clearly wins the S10 Pro, and that is the incredible 5 times zoom While the S10 Plus has only 2 times zoom. On the other hand the two handsets, got the ultra-wide, and they are really capable at capturing an entire room in one frame. But, I would side with the S10 Plus on this one, because, it can go even wider. Talking about the main cameras on both phones, we already know that images from the Samsung phone almost always look more natural than on Huawei’s phones. As with pretty much every Huawei handset we found that there’s quite a bit of processing, and quite a bit of beautification, but that’s not always a bad thing. Because, processing can help to bring out color information, and most importantly light. You see with Samsung’s omission of a proper night mode on the camera, the p30 pro is a long way ahead with nighttime photos. This phone is basically built around getting as much light as possible into the sensor, and then processing it in a way that takes advantage of it. The s10 does have that variable aperture, which can open up to F1.5 in the dark, even wider than Huawei’s f1.6. But Huawei’s software for coping with that night, is much better. The p30 Pro does have one kind of strange omission, it can’t record 4k video at 60fps. And considering that most premium smartphones in 2017 were doing that, it’s not ideal. Battery: Over the last couple of years, Huawei has been one of the market leaders in this department. And this time with a slightly larger 4200mAh battery, we expect it to be better or even overcome the whole competitors in the market. While the S10 Plus has 4100mAh, and looking at the numbers, we can say that it’s a negligible difference. But as we always say: it’s not about how mAh battery has, but it’s about the whole combination work together CPU, GPU, RAM and other electronic parts. The P30 Pro also wins the fast charging by a much less disputable margin at a whole 40W, comparatively to just 15W on the Galaxy S10 Plus. Performance: When it comes to performance, the P30 Pro honestly lose some points. It’s very hard to find any slowdown in the UI, but the raw power of its Kirin 980 chip just isn’t quite up there with any configuration of the s10 Plus. Both smartphones have advanced cooling for sustained performance over time, but just in terms of raw graphics and gaming capability Galaxy is the way to go. And something that’s often overlooked, is that Samsung’s Wi-Fi is also more capable. Whilst the p30 pro has a pretty standard 802.11 AC Wi-Fi chip, the s10 has up to four times more throughput with its 802.11 AX system. And in that sense, is just a little bit more future-proofed. taking everything into consideration, I would say the S10 plus feels like the more balanced phone it has a headphone jack, it has the GPU to play basically all games at a smooth frame rate, it has a future-proofed Wi-Fi module, a 5G version which the Huawei doesn’t. and the p30 pro has a few areas where it completely streaks ahead of almost every other smartphone, it is still close to market leading in terms of charging speed and it’s got a camera that can shoot nighttime photos like you’ve never seen before, as well as this crazy five times zoom so definitely it still one of top 6 smartphones in market now.